April 13, 2019 Sulagna Sengupta	congress, Incomplete, Photoshop, Poor editing. Whose hand is that ?? 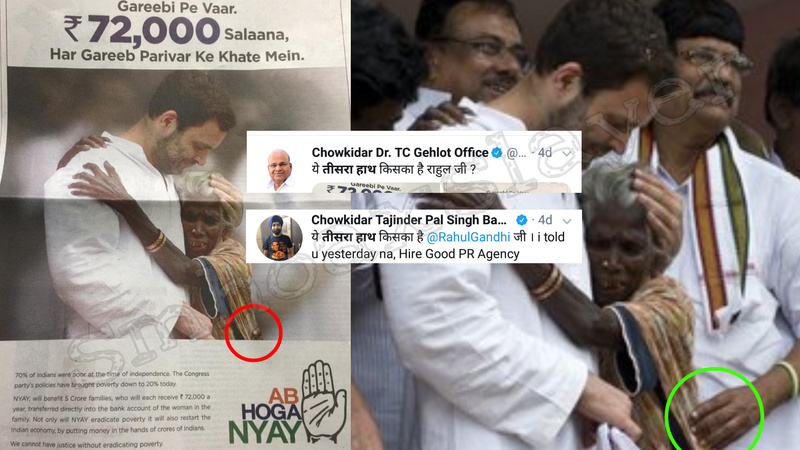 Congress President Rahul Gandhi has been trolled recently by Tweeples after a bad photo-shopped image of an elderly lady embracing him with a ghost hand behind lady’s back . The Tweeples pointed out the ghost hand behind the lady’s back asking where did it come from ? Tajinder Pal Singh Bagga, Spokesperson,BJP Delhi also asked the question with a genuine friendly advice, suggesting Congress to hire a better PR Agency. The image has been shared by Indian National Congress(INC) in the posters of its flagship project NYAY(poverty alleviation scheme) as a part of the election campaign. A Google reverse image search ound that the image was from Dec 9, 2015 when Rahul Gandhi went to Puducherry to distribute relief to flood affected victims of Cuddalore and Puducherry in Tamil Nadu. The official Twitter handle of Indian National Congress(INC) has also uploaded this photos on December 9 , 2015 . Here is the link of the photos captured by Zee news during Gandhi’s visit to Puducherry and Cuddalore in Tamil Nadu. ← Gujarat Youth Congress replaces Indian Flag digitally with their own.